The job of a retail worker is unique in its own way. You have to be on your feet for extended periods and not just standing, walking around too. While at it, you must be pleasant and friendly to customers and clients. Not easy to do when your feet ache. Many companies also specify the kind of shoes you can wear to work: whether casual or dressy. In this article, we show you what to look for when selecting retail worker shoes and also review 5 best shoes for working retail. – Realize that after standing for some hours, your shoes should no longer be considered a fashion item but a work tool: an equipment to do your job better. This distinction can save you a lot of physical pain and stress, especially when you get home from work and are fatigued due to aching feet, back and knees from wearing ill-fitting shoes all day long. – Your biggest challenge is going to be the hard floor you will walk on especially concrete. Protect your feet by wearing shoes that actually fit. Bad footwear alone is estimated to cause up to 60% of feet problems. Try to have a proper fitting done by a professional. Your feet are worth the time and money. – Purchase and wear arch support. Especially if you have flat feet. You may feel uncomfortable at first but will likely get used to using them after a few days. The below list of 5 shoes for retail working includes a review and the pros and cons of each shoe. You are sure to find something that will fit in with your work environment. 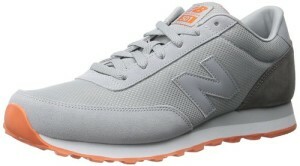 For casual and comfortable retail working shoes, consider these sneakers by New Balance. It comes in two-tone color with padded tongue and rubber sole. The body is a leather/fabric mix with shock absorbent cushioning. Pros: Casual yet stylish, good grip on different surfaces and shock absorbent. Cons: Runs a bit narrow so you may need to order 1/2 inch larger than your normal size. This is a comfortable women’s shoe for retail work that requires you to look a bit dressy. Ideal for wearing with pants, dresses or skirts. Fits the bill if you work in fashion retail, for example, where you are required to walk from one display to another. The upper part comes in leather and the heel measures about 2 inches. 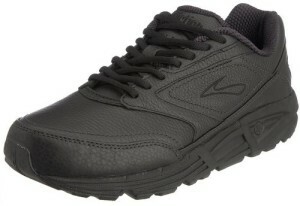 It’s cushioned and is made with odor resistant materials and has a detachable Velocor footbed for a deeper heel cup. Available in Black and various shades of brown. Pros: Looks good with a variety of clothing, very comfortable toe area. Cons: Runs a bit wide. The Caroline flats are for those that want an effortless look. It can be easily dressed up or down. 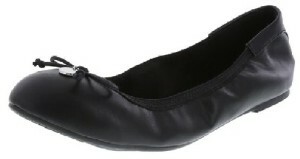 It has a flexible upper with a string bow and disc charm, elasticated topline and jersey lining. The footbed is double layered and very soft. It also has memory foam to shape and cradle your feet while absorbing shock with each step. One of the best shoes for retail work if you have to do a lot of moving around on different surfaces. Pros: Very comfortable, can be worn for long periods of standing and walking. Cons: No special arch support. This men’s shoe is recommended for retail work demanding a dress shoe. You could even wear it with a suit. 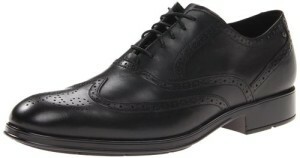 It features an attractive wingtip detail. It’s full grain leather with synthetic sole and 1 inch heel. The footbed is designed to mold your feet for added comfort and has lightweight shock absorption properties. Padded collar and tongue area reduces blistering. Pros: Comfortable and stylish. Easy to clean leather. Cons: Runs a bit narrow and some users have complained of squeaking after some months of wear. If you are looking for good arch support and comfortable shoes for working retail, this could be your best bet. The Addiction Walker offers plenty of support and is a favorite for plantar fasciitis sufferers. It has the look and build of a running shoe. 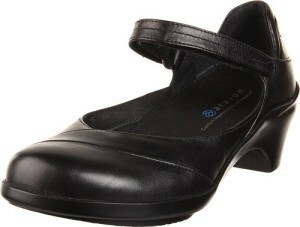 Leather constructed, has strong support and a slip-resistant sole. Pros: Great for standing or walking all day. Fine workmanship. Cons: A bit pricey and sizes run a bit smaller. The above shoes offer the choices you will need whatever your taste: casual or dressy. It would also be a good idea to have a couple or more of different styles so you can alternate them. Ultimately, when your feet don’t hurt, you are able to concentrate on the job and work better. We are sure you will deliver the desired results if you choose from our reviewed selection of 5 best shoes for retail work.